Whether you're a minimalist looking for a sleek, no-frills gift or an unabashed romantic on the hunt for extravagance, a box of assorted homemade chocolates is one of the most classic and quintessential ways to show your love. Choose from our favorite assortments, and remember — sharing is caring! 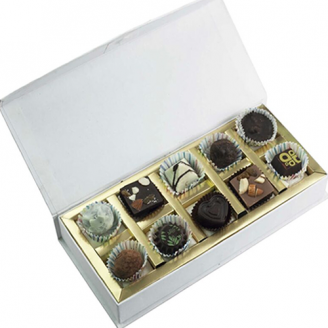 Assorted homemade chocolate gift box. A gift of a sweet chocolate box is sure to impress any chocolate lover anytime and any day of the year.